The SS United States, docked along South Delaware Avenue in Philadelphia, on Wednesday, Feb. 3, 2016. NEW YORK - The deal announced here Thursday was the one nobody expected - an attempt to restore the aged, rusting SS United States to a glamorous ocean liner and sail it across the world. The luxury operator Crystal Cruises has signed an option agreement with the ship's owner, the SS United States Conservancy, that its chief executive said could see the iconic vessel ferrying passengers to faraway ports as early as 2018, thus ending the liner's two-decade docking in South Philadelphia. Is SS United States shipping out for New York? The Washington-based conservancy had long sought to make the ship a floating hotel, museum, and retail venue, a destination for tourists and ship lovers. But a new vision emerged after the conservancy issued a save-it-or-scrap-it deadline last fall, and a strong response came from Los Angeles-based Crystal. "It is our aspiration that the ship returns to the seas as America's flagship once again," Crystal CEO Edie Rodriguez told about 100 people at a news conference here. The project's cost, if successful, was estimated at more than $700 million. The option agreement runs nine months, as the cruise line will conduct a feasibility study, including extensive checks and surveys of the vessel. There's no certainty of restoration. If any factor might sink the deal, Rodriguez said, it would be environmental issues. Rodriguez noted the undertaking was huge, difficult, perhaps unprecedented, but pledged: "Failure is not an option. . . . We're ever the optimists." The announcement - on a stage flanked by flags and flowers - was made at an appropriate seafaring setting: Pier 88, on the Hudson River, with the aircraft carrier Intrepid just across the way. Conservancy members, ship enthusiasts, and other supporters greeted the news with applause. 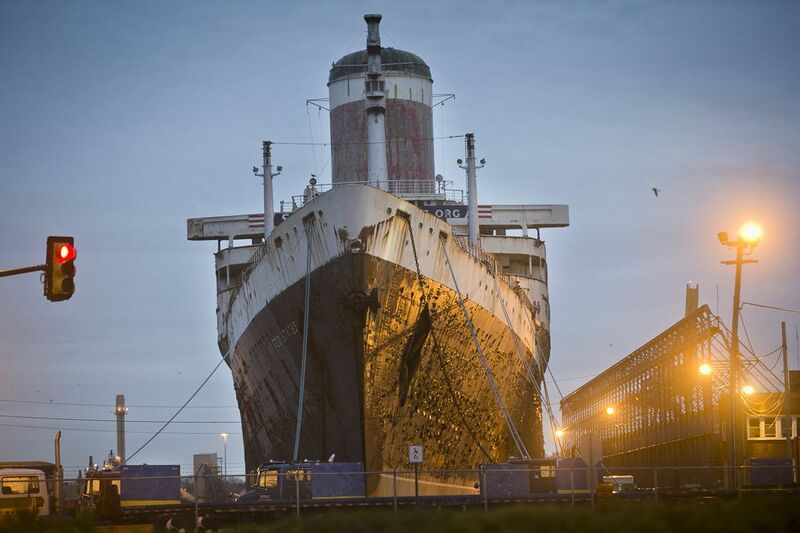 "The SS United States is ready to make history again," said Susan Gibbs, the conservancy's executive director and the granddaughter of naval architect William Francis Gibbs, who designed the ship. "Full speed ahead!" Crystal will pay the $60,000-a-month cost of docking and maintaining the ship during the feasibility study - a big benefit to the conservancy, which operates in a constant search for money. The cruise company will pay no additional fees for now. At the end of nine months, if the decision is to go forward, further negotiations would take place. "Together, we beat the odds," Gibbs told those gathered at the pier. "Together we refused to give up." The announcement marked the first time a developer has formally and publicly signed on to the project. For years, plans and hopes for the ship have risen and fallen like the tides. Even under favorable circumstances, restoration remains an extremely complicated and costly endeavor, composed of business plans overlaid with historic preservation. Its leaders had suggested New York as the best location for the ship. Plans to potentially place the liner in Philadelphia or Chester never materialized. In its day, the United States was an ocean queen, longer than the Titanic, serving as a trans-Atlantic liner making its way from New York to ports in Europe. It was built in Newport News, Va., with steel from Lukens in Coatesville. It was both liner and secret weapon: If needed, the United States could quickly be turned into a troop ship able to transport 15,000 soldiers up to 10,000 miles without refueling. The ship's 1952 maiden voyage shattered the trans-Atlantic speed record, a mark it still holds. But in the 1960s, plane travel made liners outmoded. When the United States docked in Newport News for an annual overhaul in 1969, it was taken from service. The ship was moved across the harbor to Norfolk, sold, resold, put up for auction, towed to Turkey and to Ukraine, and finally to South Philadelphia in 1996. Its furniture and interior are long since stripped. It seemed destined for scrap when its owner, Norwegian Cruise Line, offered it for sale in 2009. The conservancy was offered the first chance to buy but lacked the money. The next year, Philadelphia philanthropist H.F. "Gerry" Lenfest, until recently the owner of the Inquirer, the Daily News, and Philly.com, said he would donate up to $5.8 million. Today it floats at Pier 82, looming over Ikea and the big-box stores in the shopping center across Columbus Boulevard. It was unclear where remediation and renovation of the ship would occur, if undertaken. Eventually the ship would likely have New York as its home port, conservancy officials said. Crystal takes customers to places all over the world. Rodriguez said the United States, if restored, would display the glamour it exhibited at the height of its run. "This was the way to travel," Rodriguez said. "We aim to make her that way again."